The three sons of Noah, according to the Bible, were to be responsible for the re-populating of the world after the flood. Though Noah had three sons, it would be Shem through whom the "promised seed of the woman" would be transmitted. Shem was to be the father of the Semitic line of descent, which included the Jews, as well as Syrians and Arameans, among others. Ancient Israel tradition has it that Noah, along with the sons of Noah and their families, settled on the lower slopes of the northern side of Mount Ararat. Noah lived for 350 years after the flood, dying as the 3rd oldest man in the Bible at 950 years. All of the sons of Noah had been born after Noah's 500th birthday, as the Bible makes mention of them being grown and married before his 600th birthday. The Adamic nature of longevity still remained with Noah, and, to a lesser degree, the sons of Noah. However, as time passed after the flood, lifespans were drastically and significantly reduced. Lifespans were not the only thing that had changed with this new world, as Noah would soon find out. THE SONS OF NOAH SETTLED THROUGHOUT THE ANCIENT NEAR EAST & INTO TURKEY & EVEN EUROPE. NOTICE HOW SHEM & HAM'S CLANS TEND TO DWELL AMONGST EACH OTHER, MORESO THAN JAPHETH & HIS DESCENDANTS. THEIR SETTLEMENT STRETCHES FROM THE NORTH OF TURKEY INTO SOUTHERN ARABIA AND AFRICA. View what others have said about the sons of Noah! Wine is mentioned for the first time in the Bible in Genesis 9:21. This incident becomes a defining moment in the lives of each of the sons of Noah. Noah is said to have planted a vineyard. The natural assumption is that Noah and his sons would still practice the same farming and food gathering methods as they had before the flood. The change in environment would have had a profound affect on the soil. The process of photosynthesis was brand new to this world. The change in how the soil was watered would have also had a profound effect on not only the soil, but also what was grown out of the soil. Regardless, Noah made some wine from his vineyard, got drunk, and then passed out naked on his bed. This event happened some time after the flood, exactly when is not said. This incident becomes fundamental in understanding the history of Ancient Israel, and the relationships between the sons of Noah and their descendants. As Noah lay asleep naked in his bed, passed out from drinking too much wine, Ham "saw the nakedness of his father, and told his two brethren without". Ham did more than just see his father. The word "saw", when used in this context, indicates "gazed at". Ham gazed at his father, with apparent satisfaction at his fathers brief and rare moral slip. Why Ham reacted as he did is not explicitly stated in scripture. From the use of the word "saw", and the context of the passage, many biblical scholars interpret Ham's actions as expressing a long-hidden and built up resentment of his father's righteousness and authority. Whatever the reason or cause, apparently Ham reacted inappropriately, and went back to share in the laugh with the other two sons of Noah. This behavior would force Noah to issue the curse of Canaan to Ham's descendants. A distinct difference is seen in the reaction of the sons of Noah. Whereas Ham snickers and revels in Noah's mishap, Shem and Japheth immediately go to their fathers house, enter his room backwards, so as not to see their father in his shame, and cover his naked body. A division is seen here within the sons of Noah that will become extremely important. Author Steve McLachlan combines biblical intrigue with fiction to examine the longevity of Old Testament figures, and how that must have affected their daily decisions. McLachlan presents a biblically accurate portrait of a mysterious and fascinating time! Your satisfaction is our number one concern. Israel-a-history-of.com wishes to provide you with further resources that may interest you. Click on the Contact Us tab on the left to give us your feedback on the products we offer through our advertisers. It is interesting to note that immediately after Noah passes out naked, the Bible introduces Ham as the father of Ca'naan (v. 22). For when Noah comes to, and discovers what Ham did, it is Ca'naan, the son of Ham, that Noah curses, not Ham! The Bible mentions that Canaan received the curse as a result of Ham's actions. However, the Bible is silent as to how many generations from Canaan the curse affected, only that it was directed at Canaan as a result of his father's indiscretion. Ham's heart of rebellion had been exposed. Not only was it rebellion against his father's authority, but ultimately it was rebellion against God and His authority. Consequently, Ham will become a servant of the other two sons of Noah. As a father, Noah could not directly curse his son. Instead, he curses Ca'naan, his grandson, Ham's son. "And he said, Cursed be Ca'naan; a servant of servants shall he be unto his brethren." This curse, though pronounced on Ca'naan, was a Hamitic curse, aimed at Ham and specifically his son Canaan. The extent of this curse beyond Ham and Canaan is unknown. The sons of Ham are Cush, Mizraim, Phut, and Ca'naan, and it is from this line that will be subject to the other sons of Noah and their descendants. Cush, in the Bible, is the same as "Ethiopia". The people of Cush first moved southward, into Arabia. From Arabia they crossed the Red Sea into modern day Ethiopia. The most memorable of Cush's sons was Nimrod , chief architect of the Tower of Babel. Nimrod chose to settle down in the Tigris-Euphrates river valley. Nimrod founded his kingdom in Babel, where he attempted to erect a tower to the heavens. It was Nimrod who built such cities as Babel (Babylon), Erech, or Uruk, the legendary home of Gilgamesh, Accad, the future namesake of the Akkadian Empire, closely tied with the Sumerian Empire , and Nineveh, made famous centuries later by the prophet Jonah. Mizraim is the ancestor of the Egyptians. In scripture, Mizraim is also used to identify Egypt. 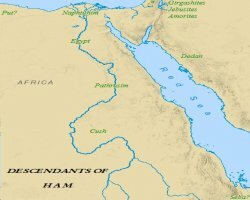 Psalm 105:23 calls Egypt "the land of Ham". Some scholars take this to indicate that Ham accompanied Mizraim in the initial settlement of the Nile Valley. The word "Mizraim" is plural. Some suggest that this was just a form of Mizraim's name. The exact form of his name is not known, however, some writers and scholars claim that perhaps the founder of Egypt's first dynasty, Menes, was in fact Mizraim. Other sons of Mizraim are listed as the names of peoples, evident by the plural -im ending. Ludim, Anamim, Lehabim, were well known and important tribes around Egypt during the time of writing. The last sons of Mizraim listed, Pathrusim, Casluhim, and Caphtorim, are very interesting. From Caphtorim came the Philistim. The Pathrusim lived in Pathros, or Upper Egypt. The Caphtorim are twice associated with the Philistines in the Bible, in Amos 9:7 and Jeremiah 47:4. The Philistines are generally said to have migrated from the island of Crete. Caphtor is identified in secular writings as Crete. These three sons of Mizraim kept their families together, eventually ending up on or near Crete. From Crete they eventually crossed the Mediterranean, landing on the eastern shore of Can'nann, settling into the land known in Biblical times as Philistia. Of the descendant's from the sons of Noah, few have had the impact and influence on Ancient Israel as the Philistines have. One of the most famous of all bible stories involves a young David facing off against a giant named Goliath, who happened to be a Philistine from Gath in Philistia. Phut is the same as Libya when mentioned in the Bible. The region of Libya applied to Northwest Africa, west of Egypt. Ca'nann plays a very prominent part in the history of Israel. It was Ca'naan who received the Noahic curse aimed at Ham, the youngest of the sons of Noah. It would be Ca'naan who would become the father of the Holy Land, the backdrop against which the drama of Israel would unfold. From Ca'naan came eleven sons, the eldest being Sidon. Sidon found the city Sidon, and was the progenitor of the Phoenicians. From Heth came the Hittites (Gen. 23:10), who ruled over an empire in Asia Minor for over 800 years. 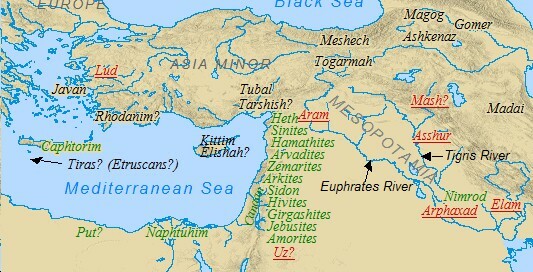 Hittites are very active throughout the entire Old Testament. They were present in Canaan at the time of Abraham , reaching their zenith sometime later in Asia Minor, yet were still a force during the reign of Solomon 1,000 years later (II Chronicles 1:17). Eventually their empire crumbled, and there is evidence that some of the Hittite people fled eastward. Cuneiform monuments record the name "Khittae", and this may have been modified to Cathay. Archaeologists have noted many similarities between the Hittites and the Mongoloids. The rest of Ca'naan's sons listed were the originators of the peoples that would populate and inhabit the Holy Land throughout the Bible. The Jebusites descended from a man named Jebus, who is described in the Bible as the King of Jerusalem , attesting to the antiquity of that great city. The Amorites are continually referred to in the Bible, and in fact are one of the more prominent tribes, as they are often used to refer to all the Canaanite Tribes collectively. The Girgasites are listed frequently, but their location is not yet found. Evidence of The Hivites have been found spread from Sidon to Jerusalem. In Syria , traces of The Arkites have been discovered around Tell-Arka. 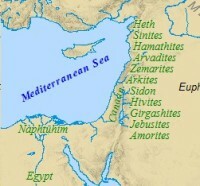 The Arvadites were centered in Arvad, a port city of the Phoenicians. Six miles south of Arvad, in modern day Sumra, The Zemarites lived. The Hamathites are associated with Hamath, a very well known Syrian city. The Sinites are an interesting tribe. There is tenuous evidence that they may be the ancestors of the Chinese. Possibly the Sinites migrated east all the way to China. Of the descendants of Ham, Sin and Heth are the two most probable ancestors of the Oriental people. 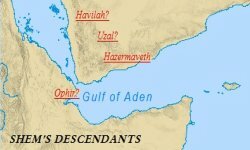 Ca'naan's descendants, according to scripture, "spread abroad" (Gen. 10:18). Of the lines descending from the sons of Noah, these peoples migrated perhaps more than any other. The contributions made by the descendants of Ham, the youngest of the sons of Noah, are staggering. They were the first explorers. They became the first cultivators of the basic food groups. They discovered and invented medicines, and surgical practices. They were the firs to develop fabrics, and the devices used to sew these fabrics. They were the inventors of mathematics, surveying, and navigation. CLICK HERE TO POST YOUR THOUGHTS AND COMMENTS. Share your thoughts, questions, and comments regarding the sons of Noah. The Bible states all of mankind ultimately derives from these three sons! Of the sons of Noah, Japheth's genealogical line is the least accounted for in Genesis. Genesis 10:2-4 lists Japheth's line. 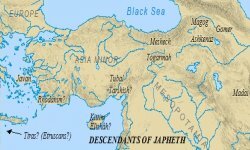 This is the extent of Japheth's recorded descendants. However, though his list is much smaller than his two brothers, he is of no less importance than the other sons of Noah. Japheth was to become the father of the Indo-European nations, also referred to as Gentiles. Genesis 9:27 makes an interesting observation about Japheth. "God shall enlarge Japheth, and he shall dwell in the tents of Shem; and Canaan shall be his servant." The word "enlarge" is an unusual translation of the Hebrew word Pathah. Pathah is not the word normally used for "enlarge", and in this instance, "enlarge" does not signify a geographical enlargement. Rachab would be the word used to convey a geographical enlargement. Instead, Pathah typically is translated as "entice", or "persuade". It is derived from the Hebrew word Pathach, which means "to make open". However, this verse is the only instance in the Bible where the form Pathah occurs, and it has been agreed upon by linguists and scholars to be translated as "enlarge". When all of this is taken into consideration, it would seem to indicate some sort of mental enlargement. This may seem like a reach. But, when an individual is "persuaded", or "enticed", then their original opinions and thoughts have changed. One's mind has been "made open" to other possibilities and experiences. Of the sons of Noah, Japheth was the most open minded brother, and his descendants would be open minded as well. Generally speaking, of the three sons of Noah Japheth would be the father of the intellectually curious nations. His descendants would be stimulators of thought, exploring new ideas and principles. Not only would the eldest of the sons of Noah become intellectually enlarged, but he would also; dwell in the tents of Shem. These two sons of Noah would be close, and maintain a brotherly relationship. The phrase, "dwell in the tents", is a common figure of speech in the Bible. Psalms 84:10 makes mention of "dwelling in the tents of the wicked". To "dwell in the tents" is another way of saying "to have fellowship with". Japheth and his descendants would not literally live with Shem in his tents, but instead would have companionship and fellowship with Shem and Shem's descendants. Even though it was through Shem that God would carry the seed of Ancient Israel, Japheth would share in many of the blessings of Shem. As one of the sons of Noah, he would come to share in Shem's spiritual inheritance. It is assumed by some scholars and historians that the son of Noah responsible for compiling the Table of Nations found in Genesis 10 was Shem. Logically, he would start with the oldest son of Noah, Japheth. By allowing for the gradual variations in names that develop over time, referencing these names in Scripture and other secular documents and writings, and through archaeological discoveries, it has been confirmed that Japheth was the father of the Indo-European peoples. Japheth's name has been found in certain documents as Iapetos, the legendary father of the Greeks, and Iyapeti, the alleged progenitor of the Aryans in India. Herodotus and Plutarch associate Gomer, Japheth's first son, with the peoples of Cimmeria, a region north of the Black Sea. Cimmeria is modern day Crimea. A certain group of Gomer's descendants eventually moved westward, and the name was more than likely preserved in the names Germany and Cambria, or Wales. Ashkenaz - son of Gomer, son of Japheth - Germany, Scandia, saxons Jews have identified Ashkenaz with Germany. In fact, to this day, German Jews are known as the Ashkenazi. This term is traced all the way back to the sons of Noah. Some ethnologists claim the name Ashkenaz was also preserved within the names Scandia and Saxon, as peoples migrated into Denmark. Other descendants from Ashkenaz stayed in Armenia. Strabo called these the Sakasene, very closely related to the word Saxon. Josephus associates Riphath as the ancestor of the Paphlagonians. Other historians and scholars have identified him with the Carpathians. Some have gone as far as to say that the name Europe is a corruption of the original word Riphath, though evidence for this may be questionable. Togarmah is very likely the ancestor of the Armenians, as Armenian traditions make this very claim. The Jewish Targums claim that Germany was also derived from Togarmah and his descendants. Turkey and Turkestan also have possible connections with Togarmah. These three sons of Japheth are closely linked throughout scripture. Ezekiel 38:2 mentions all three sons in a prophecy against Gog. Magog's name possibly means "the place of Gog", and is very likely that this referred to the region near the Black Sea called Georgia. Josephus states that Magog, or Gog, was the forebearer of the Scythians. The Scythians originally settled in the Black Sea area, which correlates to the meaning of Magog's name. Meshech's influence can plainly be seen in the names Muskovi, the former name for Russian, and Moscow, the Russian capital. Tubal has been identified on certain Assyrian monuments as the Tibareni, and more than likely his name is preserved in the modern day Russian city of Tobolsk. Ezekiel links these three brothers together in association with Rosh, translated "chief" in the King James and NIV. Rosh was the name from which present day Russia was derived. By and large, from the line of the sons of Noah, Magog, Meshech, and Tubal have come to be known and accepted by scholars as the originators of the current Russian peoples. It is nearly unanimous that Madai was the ancestor of the Medes. The Medes settled in modern day Persia. Along with the Semitic Elamites, the line of Madai were perhaps ancestors of the Persians as well. As stated above, Madai was one of two sons of Noah responsible for the Persian Empire. It was by means of Madai and his descendants that the Aryans arose. The Aryans later moved into India, and became the ancestors of the Indian peoples. Democracy and philosophy were both founded in countries originating from the sons of Noah. The name Javan is the original form of the name Ionia. Ionia is synonymous with Greece. The same Hebrew word is translated "Javan" in some passages, and "Greece" in others. It is recognized and agreed upon by scholars that of the sons of Noah, Japheth, and his son Javan, were the initiators of the Greeks. Hellas, as in Hellespont and Hellenists, is a form of the name Elishah, and came to be applied to Greece as a whole. The Tell el Amarna and Ugaritic documents, dating from the 1400's to the 1300's B.C., make mention of the Alasians. It appears that the Alasians were from Cyprus, yet another Greek connection to the sons of Noah and their descendants. Certain cities in Spain (Tartessos), and North Africa (Carthage), have been identified with Tarshish. However, this appears problematic. It is historical fact that these cities were Phoenician cities. The Phoenicians, as we have seen earlier, were Canannites, descended from a different son of Noah, Ham. It is possible, though, that Tarshish and his descendants were early settlers of Spain and North Africa. They were either conquered, or much less significant, than the more prominent Phoenicians , who played a larger role in the development of these two countries. This would not be unusual. As we have seen from examples above, oftentimes two sons of Noah would contribute to the development and formation of a particular nation, or at least contribute certain aspects to that society. Kittim has been understood to refer to Cyprus. It is plausible that the Hebrew term "Ma-Kittim", meaning "the land of Kittim", perhaps developed into the term "Macedonia". These peoples are apparently the same as the Rodanim, mentioned in I Chronicles 1:7. The influence of Dodanim can be seen in the geographical names of Dardanelles, and Rhodes. According to Josephus , Tiras became the ancestor of the Thracians. There has also been some debate that Tiras gave rise to the Etruscans in Italy. Though some of the above identifications are uncertain, they stem from rational thinking and logical conclusions based on the available data. Regardless, it is widely accepted that the descendants of Japheth spread out all over Europe, more so than any of the other sons of Noah. From this main body of settlers, one group split off and ventured into the East, to Persia and India. Genesis 10:5 states that the sons of Noah and their descendants were spread, "every one after his tongue". This migration of peoples took place clearly after the division of language at Babel. The descendants and sons of Noah spread out from Babel to all four corners of the earth. From the sons of Noah, it was Japheth's descendants that eventually acquired the term "Gentiles". The different islands, coastlines, mountains, valleys, and continents they spread to were divided initially by what language they spoke. The allusions to, "divided in their lands", and "every one after his tongue", are clear indications that Genesis 10 was written after the Dispersion at the Tower of Babel. The Japhethites were the thinkers of their time, and Japheth's descendants carried on that tradition through the ages. Greek and Roman philosophers are unquestionably some of the most influential thinkers the world has ever seen. Democracy was produced through that line of Japheth which established the Greeks. Europe would later become one of the principle contributors to the growth and maturity of philosophy and science. Dissidents would eventually break from the European powers (Great Britian), and form the United States of America. The descendants of Japheth, the oldest of the sons of Noah, have perhaps played more of a role in shaping our present day world than any of the other sons of Noah. The following is an attempt at a comprehensive list of the peoples and nations of Japheth, eldest son of Noah. India may not belong on this list, as it was once, incorrectly, thought to have been established by Aryans. This has since been proven completely wrong,and India's origins remain shrouded in mystery. An ancient civilization is likely to have existed, termed the Indus-Sarasvati Civilization, but even this term is not in wide use and not much is known about these people. Over the course of the following centuries, Japheth's descendants migrated to the America's, where they encountered the Native Americans, descendants of Ham. Thus two of the sons of Noah are responsible for the settlement and growth of the Americas. Genesis 10:21 begins the list of the descendants of Shem. Of the three sons of Noah, Shem knew that "the seed of the woman" would be carried through his descendants, and it was up to him and his line to transmit and carry the knowledge of God through the generations. Shem lists his own descendants to the fifth generation, whereas Ham is only listed to the third generation, and Japheth only to the second. It would seem reasonable to believe that Shem lost touch with much of the family after the Dispersion at Babel. In all probability, Shem was the only one of the sons of Noah that remained nearby, choosing not to migrate to Babel with the other sons of Noah. Evidence suggests that he settled near the family of his great-great grandson Peleg for his last years. It is interesting to note that before any of Shem's sons are listed, Shem is listed as the father of the children of Eber . It is from "Eber" that the term "Hebrew" came from; and the ancient Hebrew emerged into history. Verse 5 also makes mention of "Japheth, the elder" . Some versions favor the interpretation of this verse as, "Shem, the elder brother of Japheth". However, the Masoretic and Authorized Version favor the interpretation that Japheth was the elder of the sons of Noah. This also seems to fit better within the context of the entire passage. Further evidence of Japheth as the oldest comes from comparing Genesis 5:32, with Genesis 11:10 and Genesis 7:11. Genesis 11:10 provides evidence of the age of Shem when the flood happened. "Two years after the flood, when Shem was 100 years old..."
Thus Shem was born 97 years before the flood. "After Noah was 500 years old he became the father of Shem, Ham, and Japheth." Now look at Genesis 7:11. "In the six hundredth year of Noah's life....the springs of the great deep burst forth and the floodgates of the heavens were opened.."
From these passages it can be determined that the eldest son of Noah was indeed Japheth. He was 1-3 years older than Shem. The first of Shem's sons listed is Elam. Elam is the forerunner of the Elamites. The Elamites are recurrent throughout Scripture, and many monuments attest to their prominence in the region. Genesis 14 describes a confederation of Kings that waged war in Canann during the times of Abram. One of the leaders of this alliance was Chedorlaomer, King of Elam. The Elamites capital city was Susa, or Shushan. This archaic city was located east of Mesopotamia. The Noahic Prophecy of Japheth dwelling in the tents of Shem is fulfilled through the Elamites. They later merged with other peoples, namely the Medes. The Medes were descended from Madai, a son of Japheth. These two peoples joined forces to form the Persian Empire. Thus, the descendants from two of the sons of Noah, Shem and Japheth, joined together to form one of antiquity's most powerful empires. Asshur was the original founder of the Assyrians, though Nimrod later invaded the area and established his own empire. Thus, the Assyrians were a combination of Semitic and Hamitic characteristics. The natives of Assyria, those living in the area before Nimrod, were racially of Shem. Yet, after the invasion and subsequent settlement by Nimrod and his people, the Assyrians adopted Hamitic culture, language, and religion. Again, two sons of Noah are seen helping to shape and form a nation which would lead to yet another powerful ancient empire, the Assyrian Empire. Albeit very little is known of Arphaxad, he is one of the most important sons of Shem in regards to the "seed of the woman". God had promised Noah to increase his seed upon the earth, and Shem was that son of Noah through which God would bring forth the Jews and Arabs. Arphaxad, son of Shem, is in the direct line leading to Abraham. Thus, he is an early ancestor of the Israelite people. A region in Assyria known as Arrapachitis may have originated from Arphaxad's name, though this is not known for certain. Though Arphaxad probably had more than one son, only one son is listed, Salah. A possible, and indeed the most probable, explanation for this would be that it was from Arphaxad to Salah that the "seed of the woman" was transmitted to the next generation. Likewise, only one son of Salah is mentioned, Eber. Eber, like his father before him, was chosen to carry the "seed of the woman" through to the next generation. Genesis 10:25-30 depicts the descendants of Arphaxad through Joktan. Thirteen sons of Joktan are listed in these verses. It is believed that all thirteen settled in Arabia. 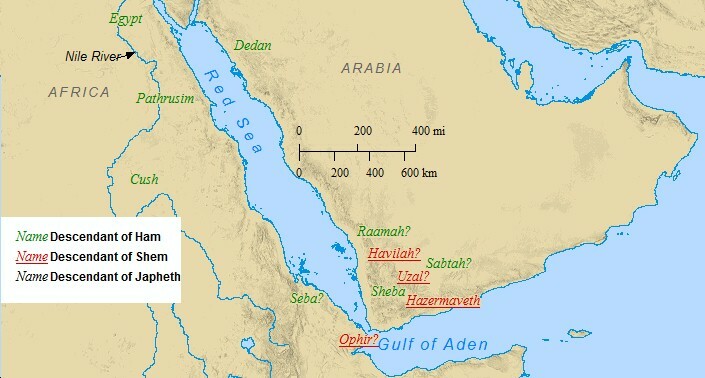 Ophir and Sheba are both undeniably sited in Arabia, the former linked with a region known for its gold, the latter associated with the Sabeans. Genesis 11:10-26 lists the descendants of Arphaxad through Peleg. "These are the generations of Shem: Shem was a hundred years old, and begat Arphaxad two years after the flood: And Shem lived after he begat Arphaxad five hundred years, and begat sons and daughters. And Arphaxad lived five and thirty years, and begat Salah: and Arphaxad lived after he begat Salah four hundred and three years, and begat sons and daughters. And Salah lived thirty years, and begat Eber: and Salah lived after he begat Eber four hundred and three years, and begat sons and daughters. And Eber lived four and thirty years, and begat Peleg: And Eber lived after he begat Peleg four hundred and thirty years, and begat sons and daughters. And Peleg lived thirty years, and begat Reu: And Peleg lived after he begat Reu two hundred and nine years, and begat sons and daughters. And Reu lived two and thirty years and begat Serug: and Reu lived after he begat Serug two hundred and seven years, and begat sons and daughters. And Serug lived thirty years, and begat Nahor: And Serug lived after he begat Nahor two hundred years, and begat sons and daughters. And Nahor lived nine and twenty years, and begat Terah: And Nahor lived after he begat Terah a hundred and nineteen years, and begat sons and daughters. And Terah lived seventy years and begat Abram, Nahor, and Haran." Peleg is more known for the event that took place immediately preceding his birth, the division of the earth. There is a chance that the Pelasgians are derived from Peleg, but this seems to be the only people ascribed to him. In all, twenty three verses in Scripture are dedicated to Arphaxad and his descendants. This is more than any other of the sons of Noah and their descendants. Obviously, there was something very special and important about Arphaxad, even though he is the least known about of Shem's sons. Genealogies serve as benchmarks of time, listing dates and years and kings. The men in these genealogies, though ignorant of the fact during their respective lifetimes, would come to be the very pillars upon which Israel would be built! It is interesting to note that in the generations immediately following the flood, lifespans were still upwards of 400-500 years. The flood had taken its toll on human life, as even 400 and 500 years are a far cry from the 800 and 900 plus year lifespans before the flood. However, after Peleg, the lifespans drop off even more significantly. It was in the days of Eber, leading up to the birth of Peleg, that the incident with the Tower of Babel took place. This is the division Scripture is talking about in relation to Peleg. Mankind had once again rebelled against God, and God saw it fit to significantly reduce the lifespans of man, perhaps in order to limit man's ability to accumulate knowledge and technology through hundreds of years of living and learning. Very little is ever mentioned of Lud, the fourth son of Shem listed. Josephus attributes the Lydians of Asia Minor to Lud. It is interesting that four children of Aram are mentioned in this passage, even though three of Shem's sons have nothing listed under their names. Scholars and historians suggest that this may be because the children of Aram had more interaction and contact with the descendants of Abraham. This would seem like a reasonable assumption, yet should not be taken as indisputable fact. Aram's children are Uz, Hul, Gether, and Mash. Though little is known of these four, two passages in Scripture shed light on one of Aram's sons, Uz. 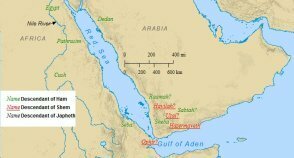 Job 1:1 : "In the land of Uz there lived a man whose name was Job..."
Jeremiah 25:20 : "and all the foreigh people there; all the kings of Uz..."
Apparently Uz's name was preserved in the region of Arabia known as Uz. This was later to be Job's homeland, and mentioned by the prophet Jeremiah as one of the nations to receive God's Wrath. The other brothers of Uz have not been identified as of yet. Genesis 10:21-29 gives the genealogy of the Semitic line starting with Shem, through whom the "promised seed" would be carried into the new world. An interesting detail is added to this genealogy in Genesis 10:25. Peleg, a direct descendant of Abraham, is listed, and alongside his name is the added notation that, "in his time the earth was divided". The name Peleg means, "division". Apparently something drastic happened in the days leading up to the birth of Peleg that divided the earth. The exact nature of this division is not mentioned in this verse, but immediately following this genealogical record, in Genesis 11, is the story of the Tower of Babel, and the division of languages. The natural assumption is that the Tower of Babel occurred in the days leading up to Peleg's birth. It thus becomes important to study the times leading up to the birth of Peleg, and how these times affected the history of Israel. Genesis 10:25 states that Eber was the father of Peleg. Eber is a fascinating figure in the history of Ancient Israel. Eber is so important that Shem is listed specifically as the "father of all the children of Eber" (10:21). Eber was Noah's great-grandson through Shem. This placed him as a contemporary of Nimrod. Eber was a righteous man, as is evident in that the "promised seed" is through his line. He is a direct descendant of Abram. Though Eber and Nimrod lived at the same time, and came from the same family, they were very different men. Nimrod, the chief architect of the Tower of Babel , and great-grandson of Noah through Ham, was a man of exceeding wickedness, and sought to thwart God's plans at every turn. God, however, will not let evil go unimpeded. As Nimrod sought to establish his own kingdom in and around Babel, and build his tower to the heavens, perhaps Eber sought to remind the people of righteousness and holiness, and to repent and turn to God, instead of turning to Nimrod and the plans of man. Eber knew that ultimately God would prevail. As a result of man's arrogance, God confused the tongues and dispersed the people. Throughout Ancient Israel, men like Eber were instrumental in the preservation of God's commands. After God's judgment on Babel, the people of that region spread out all over the world. The dispersion was all part of God's plan for the future shaping of Ancient Israel. Shem brought forth Arphaxad, who brought forth Salah, who brought forth Eber, who brought forth Peleg, who brought forth Reu, who brought forth Serug, who brought forth Nahor, who brought forth Terah, who was the father of Abram. The direct line of the promised seed travels from Shem through his son Arphaxad, and down to Abram. After the dispersion at Babel, scripture goes quiet about what was happening. Tribes of families and peoples were migrating from Babel throughout the world. Cultures and languages were developing. The exact date of this period in Ancient Israel is unknown. The reason for this uncertainty is that scholars disagree on the chronology of Genesis 11. Some say that gaps exist in this genealogical list, others disagree and say the list is complete and accurate. Genesis 10:32 summarizes the Table of Nations. As stated earlier, Shem was the son of Noah whom scholars credit as writing the Table of Nations. From Ham 30 nations are listed, 26 nations are listed under Shem, and 14 under Japheth. In all, 70 nations are mentioned from the sons of Noah. These figures were arrived at by counting the names under each of the sons of Noah. Each son, and that son's particular descendants, became the originators of a people, and eventually of a nation. Seventy nations are mentioned within the Table of Nations in Genesis 10, and "From these the nations spread out over the earth after the flood." God had told Noah, and the sons of Noah, to be fruitful and multiply upon the face of the earth. At the time of the writing of The Table of Nations, the sons of Noah had populated the earth to the extent of seventy nations. This is the first instance of any significance being placed on the number seventy in the Bible. Genesis 46:27 lists the number of Jacob's family that came into Egypt from Canaan as seventy. Moses reiterated this fact in Deuteronomy 10:22, when he reminds the people that though seventy entered Egypt, God had made them as "numerous as the stars in the sky". Daniel 9:24 allots seventy weeks for the nation of Israel's history to unfold. "Seventy 'sevens' are decreed for your people and your holy city to finish transgression, to put an end to sin, to atone for wickedness, to bring in everlasting righteousness, to seal up vision and prophecy and to anoint the most holy." Numbers 11:16, 25 speaks of "seventy of Israel's elders who are known to you as leaders and officials". There were seventy members of the Sanhedrin. Seventy scholars and linguists translated the Old Testament into Greek, creating the Septuagint. In Psalms 90:10, Moses wrote that man's years were seventy. The Babylonian Captivity lasted seventy years. Whatever the significance God attached to the number seventy, it is seen repeatedly throughout Scripture, with the first mentioning here in Genesis 10. 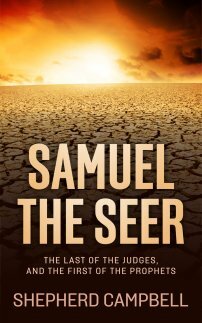 Through the sons of Noah, the post flood world repopulated itself. From Japheth, Shem, and Ham, seventy nations emerged. These seventy nations would become the descendants of the modern day nations of the world. It is important to note here, that the sons of Noah, and the respective migrations of each clan, is what laid the foundation for the biblical setting of the Old and New Testaments. Israel's history, from Ancient Israel to today, is a result of the interaction between the sons of Noah and their descendants over thousands of years. According to Ibn Abbas, the word Adam is derived from 'udmah' or the color brown. The Prophet Adam is called Adam because he was brownish in color. Are these the forefathers? What nations are they representing? These include mputu of Congo Kinshasa, who in turn are related to the kusu (kush). The Luba may be the Lubim. All these are Bantu groups. Naked, or Ham Saw Noah Worshiping a False God? Please is Ham the son Noah a prophet? Phut, son of Ham, son of Noah: Ibn Tabari mentions a wife named Bakht bint Batawil. Phut then dwell with the Hind Kush descent and Sind in India.